This content was published: October 30, 2011. Phone numbers, email addresses, and other information may have changed. 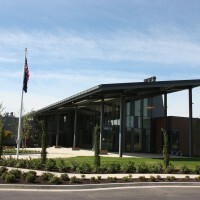 The brand new Newberg Center is the first higher education building in Oregon and one of the first nationwide to be on the path to becoming Net Zero and be awarded LEED Platinum certification. Recently, at the Portland chapter of the American Institute of Architects’ Design Awards, the Newberg Center won the Sustainability Award. This is a single award given out by the jury for the project that is the best expression of sustainability. 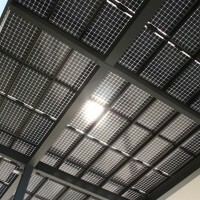 The bi-facial solar panels that harvest solar energy from the top and bottom of the panels at 25 kilowatts. A second phase will add 75-kilowatt panels to the roof – three times the current solar array size now at the Newberg Center. When this is finished, the center is anticipated to become Net Zero and generate all the power it needs to function. 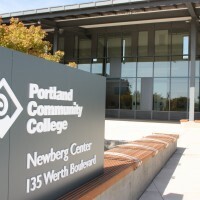 The $7.2 million facility at 135 Werth Boulevard was completed in September and opened in time for Portland Community College’s fall term. 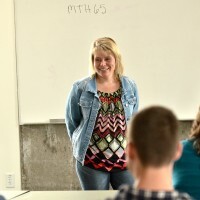 To date, the center has 653 enrollments and 60 full-time equivalent (FTE) credit students. 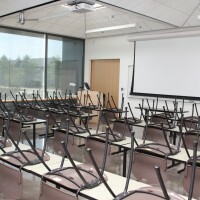 With funds from the 2008 $374 million bond measure, the largest ever passed in the state of Oregon, the college built the 13,000-square-foot Newberg Center on 16 acres of unused acreage. 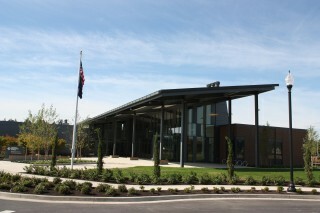 The center has five classrooms, a conference room and administrative space to serve residents in Newberg, Sherwood and Dundee. 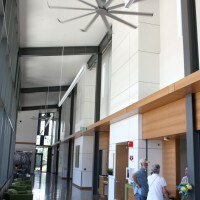 “The PCC Newberg Center was the perfect project for ‘Net Zero-readiness,’” said Linda Gerber, president of the PCC Sylvania Campus, who also oversees operations for the Newberg Center. “At just over 13,000 square feet, the building wasn’t so large that to go Net Zero would have been cost-prohibitive. Instead, it was just the right size to test this design model. 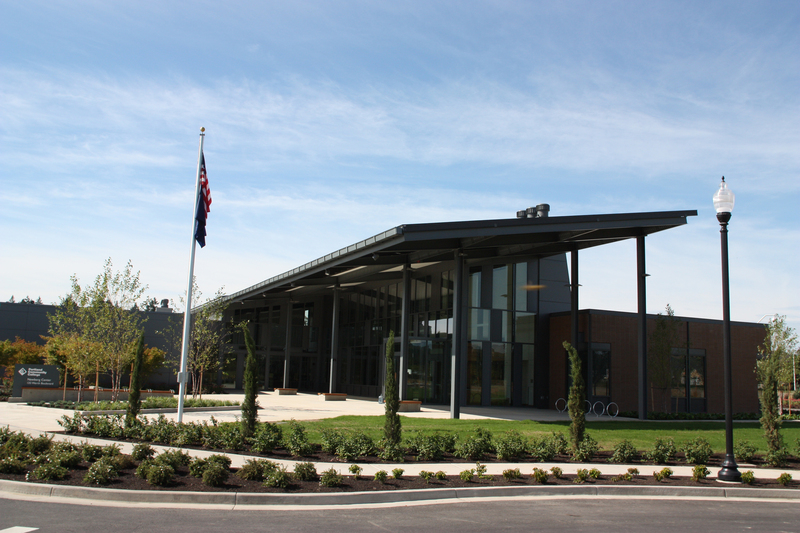 Almost every piece of the Newberg Center has a sustainability purpose from the ratio of windows to steel, to the solar panels and white roof, to the landscaping and outdoor lighting. “We’ve since learned that the facility is one of only a handful of Net Zero-ready academic buildings anywhere in country, so to be this much of trendsetter or visionary – at the same time we’re aiming to be environmentally sustainable and responsible, our true goal – is pretty cool,” she added. 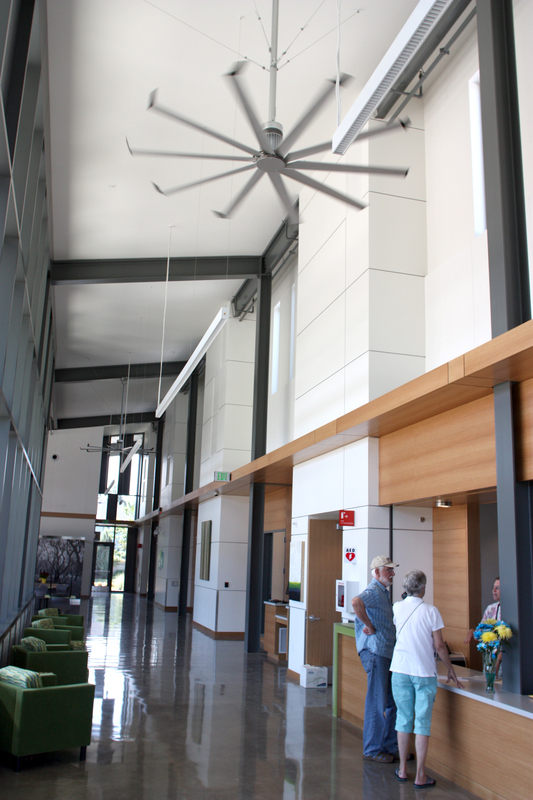 “We went above and beyond the LEED accreditation and really strived to achieve some goals the college has never really tried to do,” said Gary Sutton, bond project manager for Sylvania Campus and Newberg Center. 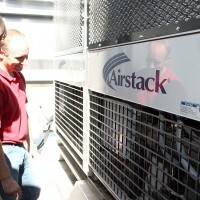 To do this, the Newberg Center has innovative heating and cooling systems. 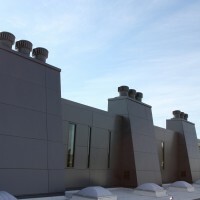 When open, the louvers on the exterior wall of the building draw in fresh air from outside and release hot air out through the five stacks along the building’s central spine. Ceiling fans throughout the building can be turned on to create air movement that makes it feel three-degrees cooler. 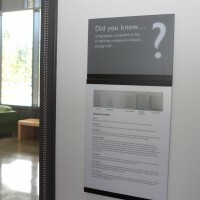 Through sustainable design, the building uses 55.5 percent less energy than allowed by the Oregon Energy Code. The exposed concrete slab and concrete shear walls act as thermal mass in the building, helping to maintain even indoor temperatures all year long. The concrete, which has better storage capacity for heating and cooling than the surrounding air, absorbs and stores heat or cold and then releases it many hours later. The concrete slab has tubing with 90-degree water running through it to heat the building to 68 degrees. 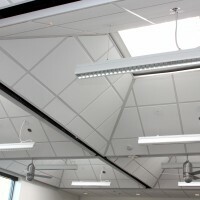 In addition, the building skylights are integrated into a sloped ceiling system designed to bring even and diffused light to the classroom and office spaces without the need for electric lights. 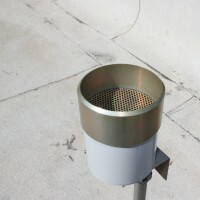 The design reduces the center’s energy use by more than 15 percent. Erica Dunn, project architect with Hennebery Eddy Architects, the firm that designed the center, said its green features make it a model of LEED Platinum facilities. LEED stands for Leadership in Energy and Environmental Design with a special focus on new construction. 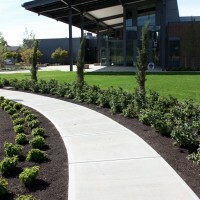 The green features of the Newberg Center are numerous. 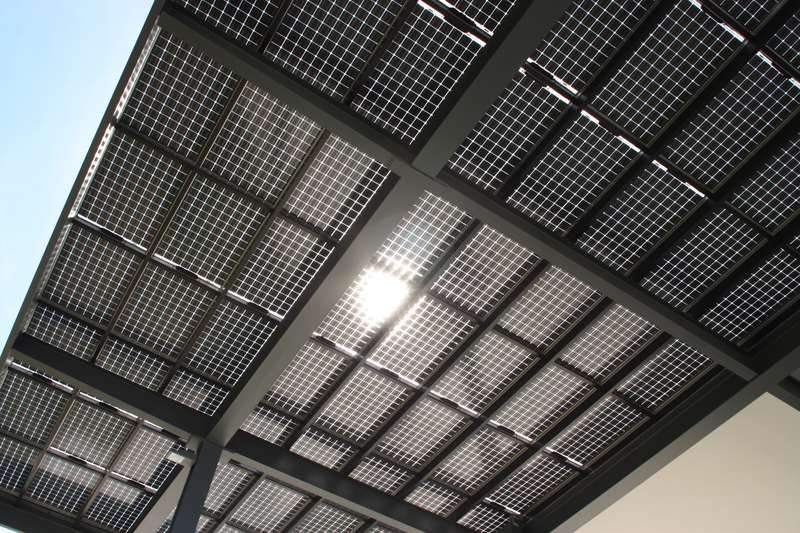 The most visible are the bi-facial solar panels that harvest solar energy from the top and bottom of the panels at 25 kilowatts. A second phase will add 75-kilowatt panels to the roof – three times the current solar array size now at the Newberg Center. When this is finished, the center is anticipated to become Net Zero and generate all the power it needs to function. 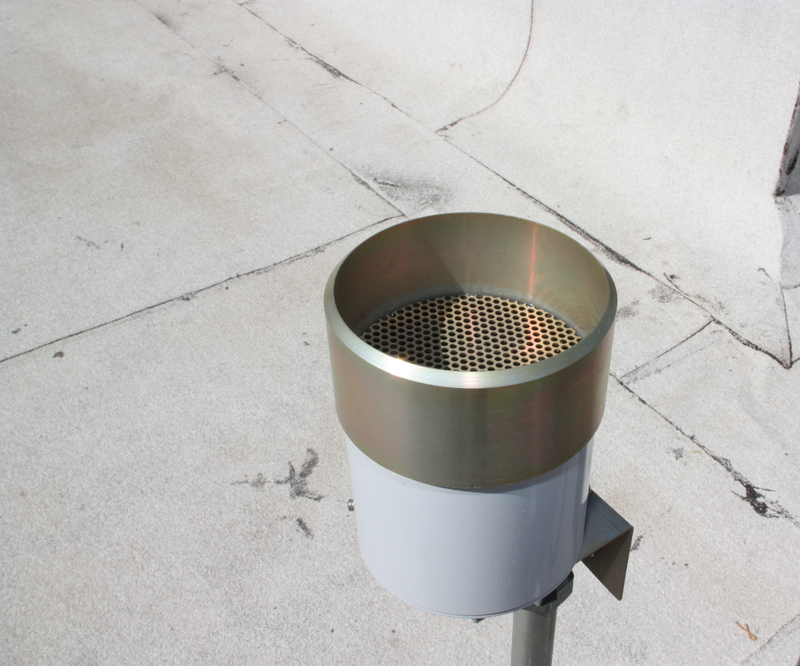 A weather gauge on the roof alerts the building to whether watering is needed for the surrounding landscaping. The white roof membrane in the background reflects the sun's rays and keeps the building cool in the summer. The roof and ceilings have structurally insulated panels (SIP), which are two panels with insulated foam in between them. This provides more insulation than a typical wall because there are less thermal breaks than using studs, providing an even temperature throughout the building. On top of these SIP panels and just underneath the roof membrane is a leak detection system. It uses approximately 80 percent less energy than standard higher education academic buildings in the United States. Through sustainable design, the building uses 55.5 percent less energy than allowed by the Oregon Energy Code. 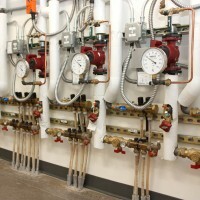 Each classroom and the office space are equipped with a Heat Recovery Ventilator (HRV). When outside temperatures are below 55 degrees, the HRV will bring in fresh outside air that is warmed by transferring heat from the hot air being exhausted from the space. All of the parking lights are LED fixtures, the only campus in the district to do this. The lamps cast light down and not into air to honor Newberg’s dark skies policy. Inside the center, all of the light fixtures are T5 bulbs, which are high-efficiency. 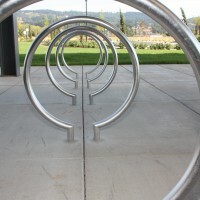 Bicycle parking is provided near the front entrance under the solar canopy and there are shower facilities to encourage people to ride. And that’s not all. The roof is painted white to reflect the sun’s rays and thwart what the architects call “The Heat Island Effect.” This is where dark concrete and asphalt can make it 10 degrees warmer in cities than in natural areas. 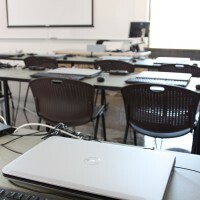 The Newberg Center will use all laptops (Netbooks) in its computer labs to save energy as these use less energy and heat up the room less. 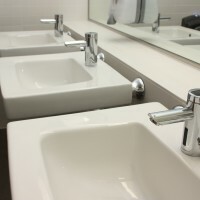 The facility will have the usual green building features of low-flow bathroom fixtures and utilize hand dryers that use one-tenth of the energy of paper towels.